The most decorated Olympian of all time can now add another sports win to his roster. 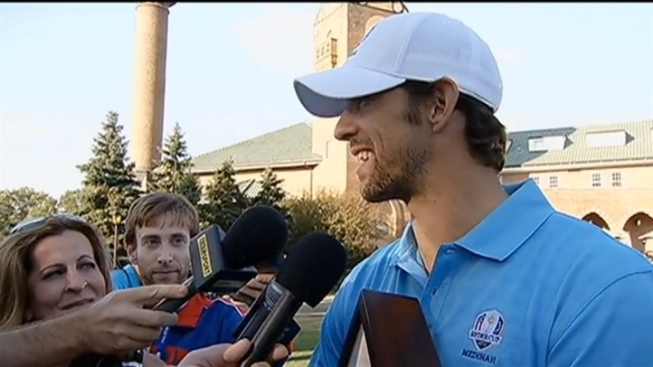 Michael Phelps and 2004 U.S. Ryder Cup Captain Hal Sutton, 1995 U.S. Ryder Cup Captain Lanny Wadkins and actor and comedian George Lopez won the first-ever 2012 Ryder Cup Captains and Celebrity Scramble on Tuesday. After posting a score of 9-under par, the foursome bested other teams featuring past Ryder Cup Captains, celebrities and local Chicago sports heroes in the event at the Medinah Country Club. "This is fun. It's fun to clown around," said actor Bill Murray, well-known for his appearance in the Caddyshack movie. "It's a great event." The event had former cup captains teaming up with sports legends and celebrities for 10 holes that had fans cheering and laughing. The celebrities included Murray, Lopez and Justin Timberlake. They were joined by Chicago sports legends Ernie Banks, Richard Dent, Stan Mikita, Robbie Gould and Scottie Pippen. Participating captains included Ben Crenshaw, Tom Kite, Tom Lehman, Corey Pavin, Dave Stockton, Hal Sutton, Lee Trevino and Lanny Wadkins. The team of Lehman, Stockton, Timberlake and Murray finished 6-under par, as did the team of Pavin, Trevino, Gould and Mikita. The team of Kit, Crenshaw, Pippen and Dent finished 2-under par. "Our participating celebrities and past Ryder Cup Captains are excited to bring their best golf games to Medinah," Ryder Cup Director Michael Belot said before the event. 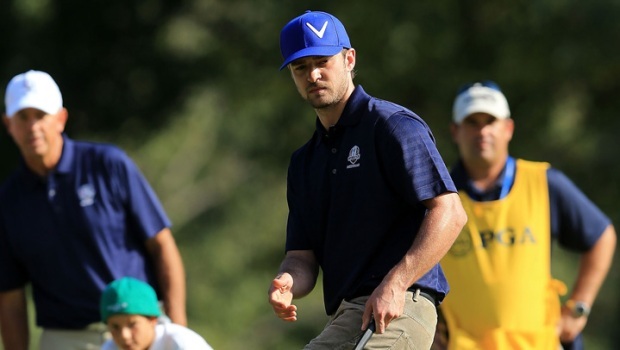 Timberlake earlier this summer was named first-ever Ryder Cup U.S. Ambassador, and Olympic medalist Phelps is scheduled to star in the Golf Channel's "The Haney Project." Lopez will also perform at the Akoo Theatre at the Ryder Cup Gala on Sept. 26.